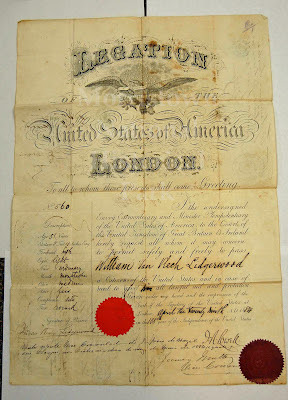 This is the passport of global businessman William van Vleck Lidgerwood—one of the founders of the Washington Association of New Jersey. 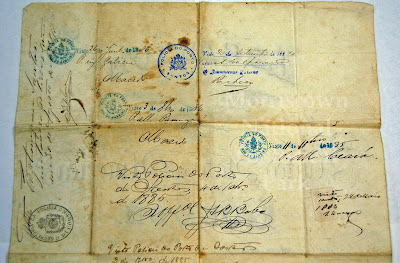 Lidgerwood spent most of his active business career traveling in Europe and South America and more than likely had more than one of these documents during his life. As a world traveler, Lidgerwood was exposed to the extensive history of Western Europe and the America’s and saw himself as an inheritor of that history and legacy. Lidgerwood grew up in Morristown and was well aware of the Ford mansion and the Washington stories associated with it. When the mansion and property became available at auction after the death of Henry Ford in 1872 (the last Ford family member to live in the mansion) Lidgerwood was one of the hundreds who attended to watch the spectacle of history for sale. Whether by advance planning or spontaneous happening, Lidgerwood and three other prominent New Jersey residents came together to bid on, and win, the mansion house itself. They tried to offer the building to the state of New Jersey to operate as a historic house museum. The state however was not interested. Lidgerwood and his colleagues then decided to form the Washington Association of New Jersey to operate the mansion as a memorial to George Washington and to commemorate his stay during the 1779-1780 winter encampment. The Washington Association ran the mansion until 1933 when they turned it over to the National Park Service to form part of the Morristown National Historical Park—the first historical park in the nation. The Washington Association today is a partner of the park.